“My painting is intended to capture mood, while evoking the similar expressions being depicted. This intention of capturing feelings and ideas has materialized into an interesting body of figurative art. I find myself breaking down expression into individual modules of the human form. Focusing on individual parts of the face and body and experimenting with the tactile nature of paint application, I am capable of dissecting the translations of this message”. 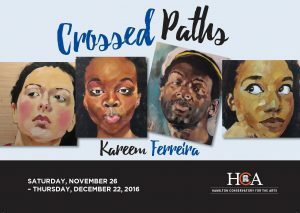 Kareem Ferreira was born in Hamilton, Ontario. Ferreira works predominantly in the medium of acrylic painting, but includes different mixed media, such as paper collage, graphite, and spray paint on wood panels. Ferreira completed his Honours Bachelor of Fine Arts at McMaster University in 2011. He has shown in Hamilton, New York City and Winnipeg at DeFacto Gallery, Gallery 623, HAVN, My Dog Joe Coffee, Hamilton Conservatory for the Arts, McMaster Museum of Art and Workers Arts & Heritage Centre.